Do You Keep a Riding Journal? 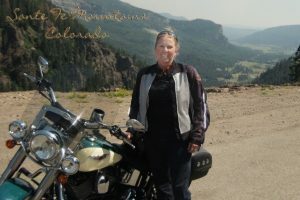 One of our clients always keeps a journal of her motorcycle travels. 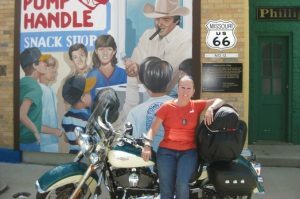 Follow along as she takes you through a 22 day motorcycle trip from Indiana to California & back on Route 66. Maybe on your next journey you can share your ride journal with us! June 3 – Today we ended the day in Montrose, IL We got misplaced once, almost run over twice, and stopped at two HD Dealers. 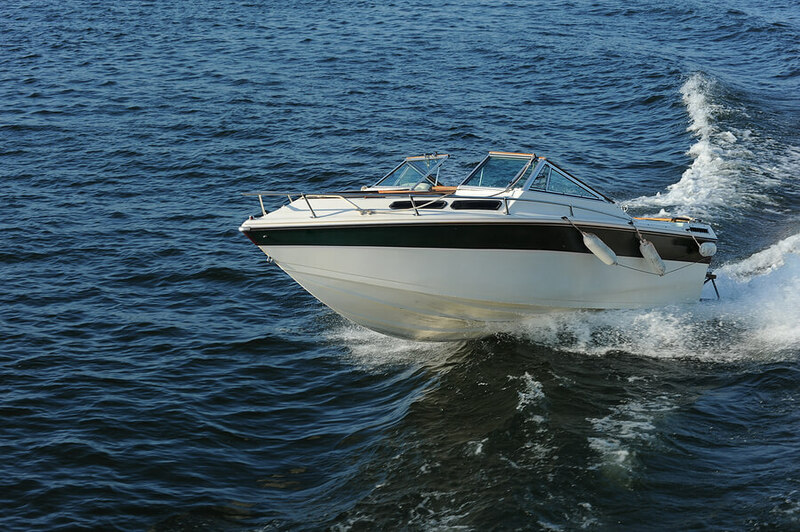 First dealer was in Kokomo, IN and the second Terre Haute, IN. We ate at the Fashion Farm in Ligonier for breakfast, and a Steak in Shake for lunch. Supper was a gas station convenience store, microwave hot dogs, chips and ice cream. Some days you take what you can get. June 4 – Today we ended the day in St James, MO. We visited Jesse James Hideout in Stanton, MO. We saw a lot of awesome Route 66 building murals in Cuba, MO. We saw the world’s largest rocking chair that was 46 feet high along Route 66 just west of Cuba, MO. It was HOT but a great day. ke his bike in to have the primary fluid checked at the Ozark HD in Lebanon, MO. After we left the HD dealer we ran across an old bridge on 66, called Rainbow Curve Bridge in Kansas. We passed our turn as we often do, and in the process of turning around I dropped my bike, I hate being the first, LOL, but it was worth it. After we turned around we drove on the bridge we took several pictures of the bridge, bikes, and the Route 66 emblem painted on the pavement. After that in our process of looking for a hotel, Tom dumped his bike in the gravel at a gas station, my poor husband, Ray, felt left out that day. 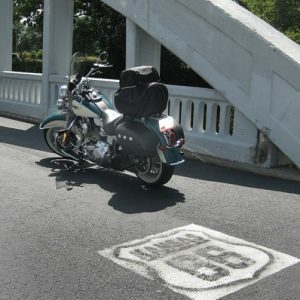 June 6 – Ended the day in Tulsa, OK. Today we started out on Route 66 out of Miami, MO, headed to the Route 66 HD dealer in Tulsa, OK. We wanted to visit but I also needed my back brake checked, it started feeling mushy. By the time we left the dealer, I had purchased a new back tire, had the brakes bled, and Tom bought a new front tire. What an expensive visit! Off again picking up Route 66, we didn’t get too far until the weather started to roll in so we decided to sit tight and head to Oklahoma City on Thursday. We are planning on visiting the Oklahoma Federal Building Memorial tomorrow. June 7– Ended the day in Hinton, OK about 100 miles from Amarillo, TX. 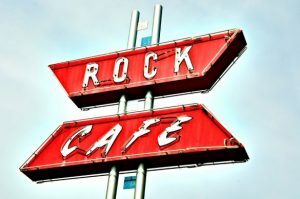 We left Tulsa on Route 66 and stopped at Stroud, Ok where we had coffee at the Rock Café. 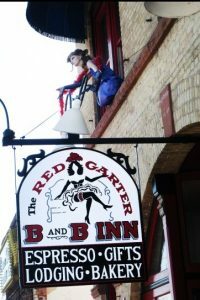 It had been featured on the tv show Diners, Drive In’s, and Dives, very cool place. We stayed on Route 66 for a while and then headed to the Oklahoma City Federal Building Memorial site today, it was very humbling. The tragedy and suffering those people endured was displayed very well in the stories and images at the memorial. We even listened to a recording of the actual bomb exploding. We had someone take a picture of all of us under the “Survivor Tree” a 90 year old elm that survived the bombing. We ended the day in Hinton, OK.
June 8- Ending the day in Panhandle, TX just outside Amarillo, TX. We left Hinton, OK and picked up Route 66, spent the biggest portion of the day on 66. We stopped at the Route 66 Museum in Elk, OK. Spent a few hours there, then ate at Braums Ice Cream and then off back down 66 towards Amarillo, TX. 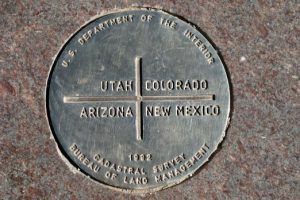 June 9 – Ended in Tucumcari, New Mexico. Rolled in and it was 102 degrees and 3% humidity. 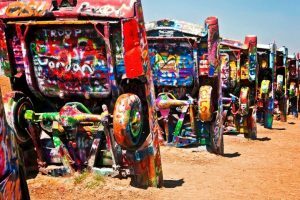 When we left Panhandle, TX we headed to Tripp’s HD in Amarillo, then off to the Cadillac Ranch where several Cadillac’s are buried nose down out in the middle of a field on Route 66. We traveled 66 for several miles. After leaving the ranch we stopped at the Boothill Saloon in Vega, TX for lunch. Very cool place and just what we needed because it was beginning to get really hot. We left Vega and headed west and decided to spend the night in Tucumcari, NM at the Old Route 66 Motel. Did laundry and dried some clothes outside. We stretched a bungee cord between the bikes and everything dried in about one half hour, now that’s hot. We are going to leave tomorrow at 5:30 am to get ahead of the heat. June 10 – Headed out of Tucumcari, NM at 5:30 am. Got on I 40 then picked up Route 66. Headed up Hwy 84, landed in Pecos, NM. Took pictures of American Legion Post 70 in Pecos, NM. Went to the HD dealer in Santa Fe, NM and then headed to Albuquerque, NM to bed down for the night. 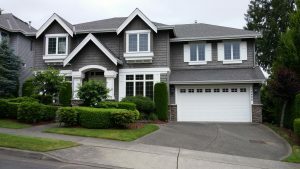 June 11 – Not much today, poor Tom had to take his bike to the dealer to get a seal repaired so the rest of us just hung out until he was done. We left Albuquerque, NM about 12:30 pm and headed west on I 40 towards AZ. We ended our day in Holbrook, AZ at the Motel 6. Headed out in the morning and off to the Grand Canyon. June 12- On the road early headed to the Grand Canyon, made a few wrong turns in the parking lot but made it to where we needed to be. The canyon was just as my aunt had described it to me, a big, beautiful hole. I took many pictures and can’t wait to get home to edit them. We picked up a few sections of Route 66 along the way, one section in Williams, AZ where we landed for the night and stayed at a Roadway Inn, headed to Hoover Dam and Nevada tomorrow. little R&R. Going to get up real early in the morning to beat the heat and ride to California, just to say we rode to California and back. Walked Las Vegas Blvd tonight for a short time, quite a sight, little bit of everything and everybody. A nice young man saw me taking pictures and he struck up a conversation because he had a Nikon but really didn’t know how to use it. So as I always do I gave a free camera lesson right there on Las Vegas Blvd, LOL. The couple was so nice we sat and talked for a while and then headed off for ice cream and then off to bed. on a track, and plenty of memorabilia to look at. We headed down the Blvd to the famous pawn shop from the show on the history channel. Didn’t get to see any of the family members but was cool to take a look around. We are headed out tonight to the casino buffet and then ride the Las Vegas Blvd. We ate at the casino buffet, not bad, just ok food, then off to gamble. I had never gambled so it was a little interesting until I got the hang of it. We spent $18.00 and won $10.75, oh well it was fun. Headed back to the rooms to change clothes and ride the strip at night, OMG what a nightmare! Beautiful but a mess, hot, traffic up the wazoo even on a Thurs evening. One hour down the strip and one hour back because of traffic and the bikes got extremely HOT! We survived but all agreed we need our heads checked for even thinking that was going to be fun. Off to bed to head out before the 100 degree heat sets in again. 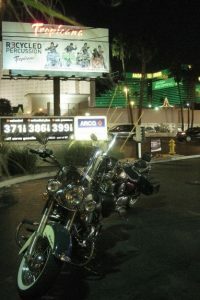 June 15 – Left Las Vegas at 7am headed up I 15 north, stopped for breakfast and then on down the highway. 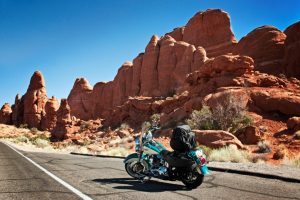 The ride was beautiful, it was cooler and the rock formations on I 15 were beautiful. We landed in Beaver, Utah for the night. Did laundry, ate a late lunch, down loaded pictures, and as usual planned our route for tomorrow. We are off to Green River, Utah to spend the night before heading to Arches National Park and the Four Corners. June 16 – Left Beaver, Utah today and landed in Green River, Utah. Headed to Arches National Park early tomorrow before it gets too hot. Hope to spend Sunday evening in Blanding, Utah. The ride today was breath taking, southern Utah has by far been the most scenic. Every curve and turn brings more breath taking views. June 17- Well we didn’t quite follow our plan today. Ray’s bike has a coolant leak so we headed 60 miles north to Price, Utah to the nearest Kawasaki dealer. Stayed at the National 9 Inn. So glad too because I got into to gluten somewhere and ended up sick. Slept all afternoon, showered early and headed to bed. After Ray’s bike gets done at the Kawasaki shop we’ll head back down to Green River again and try to get to Arches National Park on Tuesday. June 18- Got up this morning and took Ray’s bike to the Kawasaki shop. It wasn’t long afterwards he was fixed and we were back on the road, then off to Green River to spend the night. Tomorrow we’ll get up at 5am and head to Arches National Park before it gets too hot. After a few hours at the park we’ll head to Blanding, Utah to spend the night. Up this morning at 5am to beat the heat, packed and breakfast done by 6:30am and down the road we go to Arches National Park. Arches National Park was beautiful, we got there before the crowds hit so at least it was easy to pull off and take pictures. It’s a long 18 mile, very winding drive with many pull offs and parking lots. I have waited years to see this park, ever since I developed an interest in photography. It wasn’t ideal conditions to take pictures but I have some! We stopped in Blanding, Utah for the night and will go to see Four Corners tomorrow. June 20- Up and on the road at 8am today, headed to Four Corners. It’s where New Mexico, Arizona, Colorado, Utah all comes together. 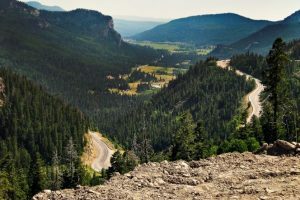 Once again it was hot, but we had a beautiful drive to get there through open range country. After we left Four Corners we headed out on 64 east to Farmington, New Mexico to Four Corners HD. After spending a little time there we headed east, then north and picked up 160 East through Colorado, OMG. Beautiful winding highway through the San Juan Mountains, and ended in Monte Vista, CO for the night. We had to pay $111.00 for one night because every motel with in a hundred mile radius was booked full and it was only 6pm. Oh well it was the first time in three weeks it has happened, so that’s not all bad. June 21-Talk about a temperature change, a whole lot more chilly through the San Juan Mountains in Colorado. We were in the clouds so that didn’t help the temperature any. After we got out of the mountain range the temp was quite pleasant and it was a nice ride to Kansas. We ended the day in Ulysses, KS. June 22- Up at 6am and on the road by 7:50am, we rode 500 long miles across Kansas on route 160. We ended up in Mt Vernon, MO. Only 655 miles to HOME! June 23 – Ended in Greenup, IL today, rode 375 miles today, but somehow it seems much longer, I must be getting tired and ready for home. June 24- Up this morning at 6am and rode out for the last leg of our journey. Back roads turned into detour after detour, we finally made it home at 3:30 pm. After 22 days of riding we had logged 5048.2 miles riding to California and back, something I can now scratch off my bucket list. https://lesliekays.com/wp-content/uploads/2019/02/LKI_Logo-Trademark-1030x597.png 0 0 Tosten1 https://lesliekays.com/wp-content/uploads/2019/02/LKI_Logo-Trademark-1030x597.png Tosten12017-03-30 16:40:392017-03-31 14:25:20Do You Keep a Riding Journal? 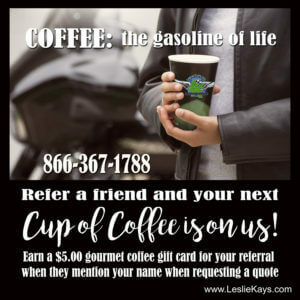 Leslie Kay’s Insurance has been providing customers in the 48 contiguous states the best service and coverage for all their insurance needs since 2000. They work hard to find you the right insurance company for your specific needs. 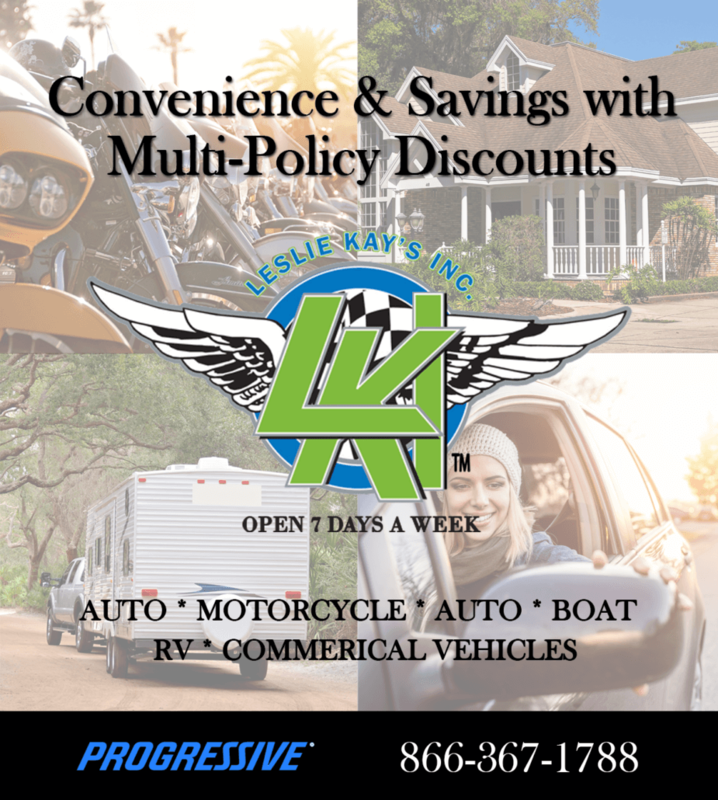 Because they’re an independent insurance agent they can shop for a great rate on motorcycle, auto, home or RV through multiple carriers. 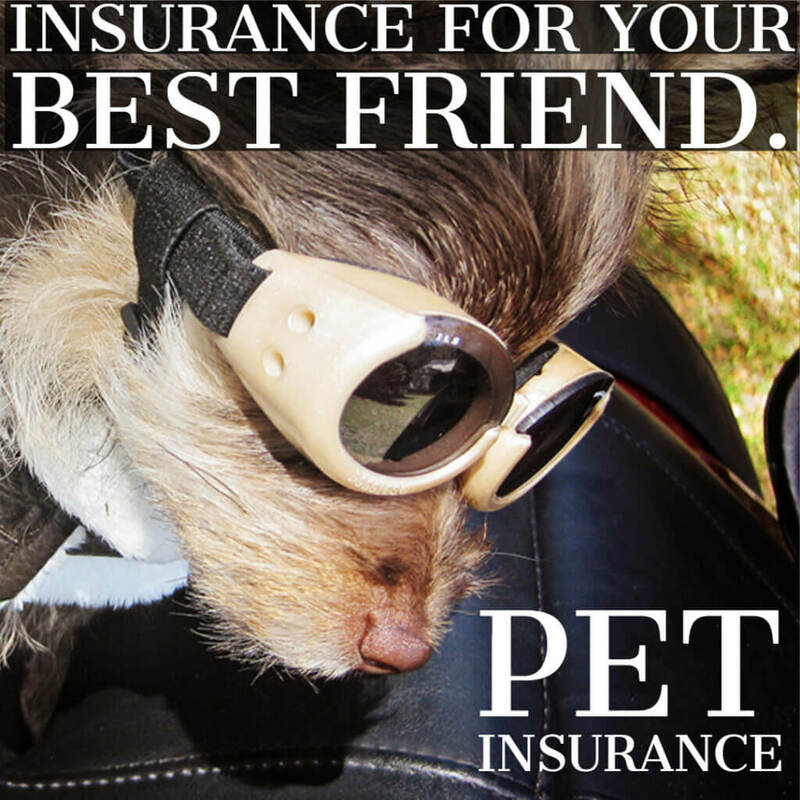 Checkout their insurance website 24/7 or request a quote and an agent will call you back!